I'm in the process of trying to update information on this blog. I have done away with the "photo" area... and just put Kaylie & Mason's MRIs under their story. Sorry for the changes, while you are reading the blog! I also want to give a special shout out to "Barbara"... she know who she is, and we want to Thank You for all the cards you send with warm thoughts, support and prayers. We really appreciate your kind words! Hope everyone is having a good weekend!!! Can you believe how fast 4 weeks have gone by!!! I couldn't be happier with how everything is turning out, I just hope it stays this way. I'm scared one day I will wake up, and she will have headaches or ear pains again. But as much as I do know this wasn't a "cure" .... I think she is going to be fine! She has not taken Zyrtec in a few days, as you know she was taking this for the itchiness. I think it was more the steri strips and the tape adhesive that was causing all the itchiness, and maybe even irritating it. As you can see in her 1 Month Post Op Pic... it looks great! Hardly any redness, no swelling, no gaps!!! I did a lot of research on applying vitamin E oil to the incision area. There are a lot of people and medical people that say its a good idea, and that it helps with the scar. But there were also a lot that discouraged it, saying that some have skin reactions to the oil, sometimes even a soy reaction. I did try it one day... and it was on for about 30 to 45 minutes... and she started saying that it was really itchy, and she looked a little blotchy. I don't think Kay had a full blown "reaction" to the oil, but I do think it wasn't right for her. So, I am doing what Dr. Rekate suggested. I went out and bought Mederma. It's a scar healing ointment. 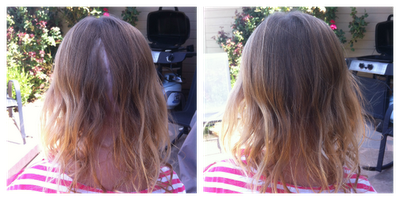 It helps with fading the scar, and the actual incision line not being such a darker color than her skin. I bought the cream one... its like a lotion, and it also as sunscreen in it. The original is a gel like substance. It has sunscreen in it, because it is best to keep scars while healing out of direct sun light. We put a little on twice a day. I have only put it on for 4 days... and I do think it is helping! BTW... you can use Mederma on old scars too, not just new ones! So, Why am I so finicky over her incision /scar. 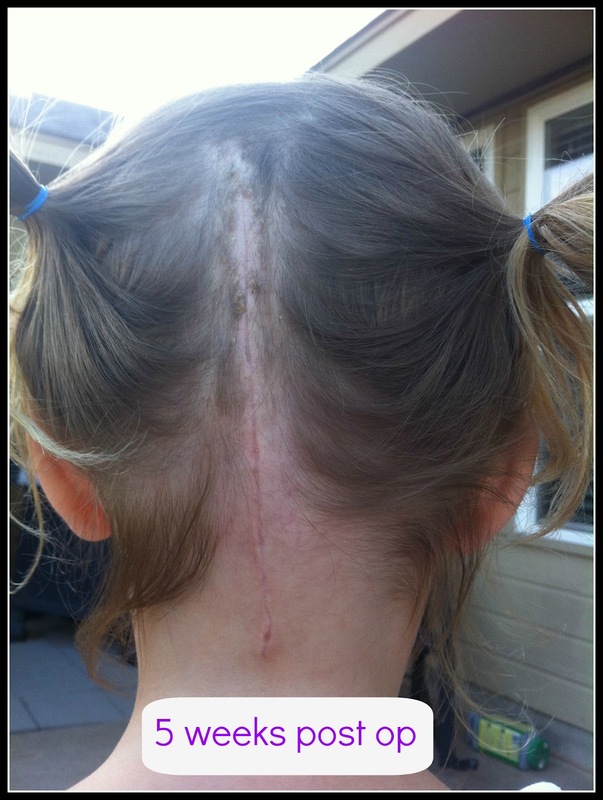 You know a lot of "Zipperheads" (that is a nickname a lot of chiarians call themselves, because of this scar)... are proud of it, because they have gone through so much. And I agree! I am VERY proud of Kaylie for being so strong. BUT... she is a girl, and at that a girly, girl. So if I can take care of her incision/scar to the fullest, to make sure it heals nice, and not as noticeable... I will. 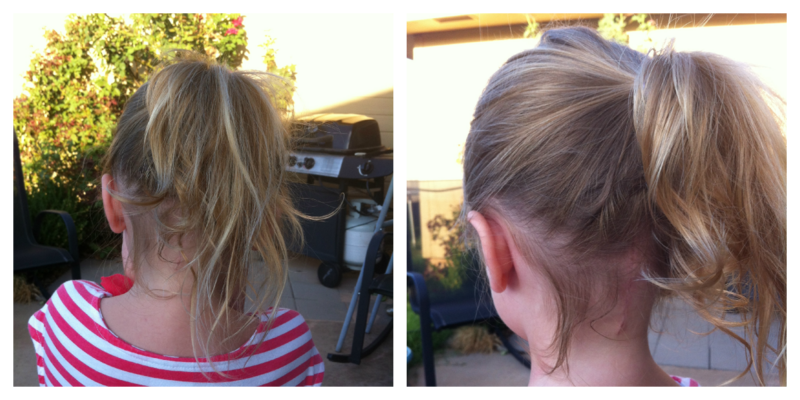 I don't want her being 15 or 16, wearing her hair pulled up for a special occasion, and being so self conscious of it. If I can help in that process, I will. I want her to be proud, but also feel good about everything! On other notes... She is still doing well physically, with her recovery. I think she will be going back to school at the 6 week point. She is ready, I think she is starting to get a little stir crazy around here. I have had a little more time on my hands right now.... and I can feel that my thought process has started to full on worry about Mason. I try to keep telling myself to wait for the next MRI. But its hard not to worry. least I know we have a great doctor working with us. The Conquer Chiari Walk Across America is a month away!!! Its Sept. 22nd in Tulsa, Ok. I was asked to speak at it, along with a couple other people. I'm really excited. Also, I am holding OKC's first Chiari support meeting Sept. 5th. There is one sometimes in Tulsa... but there are a lot of Chiarians near the OKC area. I think we will have a good turn out, and I'm excited to turn this into something big! I also need to take the time to continue to say "Thank You" to all of our supporters! The Love, Prayers, Support... everything means so much to us. We couldn't be doing it without everyone. ....Thank You! A little info on the incision: Again... the white tape strips, are steri strips (they are like a heavy duty tape).. that was the only thing holding her incision together. The dark blotches in the middle under the strips is just dried blood, scabs forming. As you can tell after they came off there are no sutures or staples under the tape. There is sutures inside/under the incision, those are to close other layers. The process of steri strips coming off: Dr. Rekate told me it can take a week to week in a half. Kay's took 3 weeks... I didn't rush them. I've been told the longer they stay on, the smaller the scar line will be. How they come off.... and personally after reading other peoples posts in groups, and what not ... I think are process was the best. Steri strips are very sticky... they will stay stuck for awhile, I have heard some ripping them off... which I would think that would cause irritation to the incision, could even inflame it some. Our process was every time we washed her head, I would allow her to soak her head for awhile. With doing this, they began to loosen. One the day of "2 weeks & 1 day"... all the edges of the steri strips were loose, the only thing that was holding them on, was the dried blood/scabs in the middle. The steri strips begin to curl up on the top and bottom of the strip, and then you just check to see if they gently peel off. On that same day, there was one in the middle, and a few on the bottom that came off. The rest were still on, so we left them. Then a couple days later... the whole section of the middle came off. And as this week had gone on... different areas would follow. So she has no complaints of it being painful... I do know it is tender, and expect it to be that way for awhile. So we are very gentle when combing her hair out after we wash it. I am still washing it, all though she is able to shower on her own... I prefer to make sure that area is gently done, and all soap residue comes off. She does complain it is very itchy, and is on Zyrtec for that. You can notice towards the bottom of the incision that it looks a little more red and blotchy... that's the itchiest area, I have sent pics to Dr. Marcy & Dr. Rekate, to see if they want me to give her something else for the itchiness, or maybe a cream. I also asked Dr. Rekate about applying vitamin E oil to the incision area. I have been told that vitamin E oil, will help the scar line, and break up scar tissue build up underneath. We will wait to see what he replies. All in all it looks very good. Today my sweet baby girl is 6 years old! Tomorrow she will be 3 weeks post op, and she looks great!!! So, before we ever went to NY for Kaylie's surgery, I was originally planning a birthday party for Kaylie to be held this coming weekend. Something where people could come and go, see how she is doing. 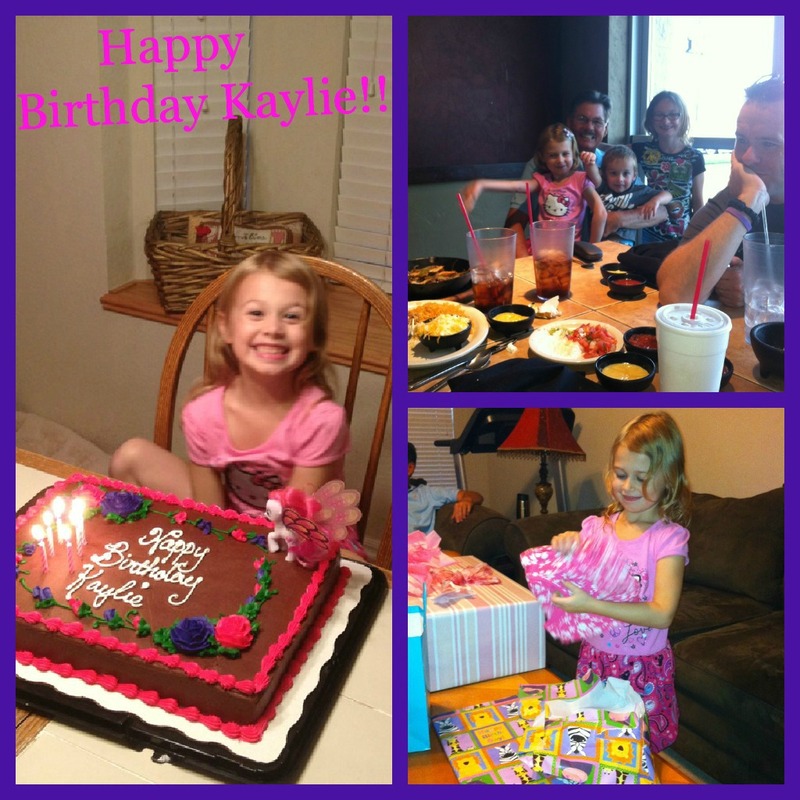 Even a few party vendors were wanting to donate their time and services for Kaylie's party. BUT.... when we got back, and that Monday she spiked the fever... I told Ben, I couldn't and didn't want to do it. Besides at that time I didn't know what was going on with her... i just didn't want anyone around her, or a bunch of kids... that may accidentally bump into her head. So we decided no party this year. Instead, my family and us got together last night, had dinner out, and came back to our house for cake. It was the best! 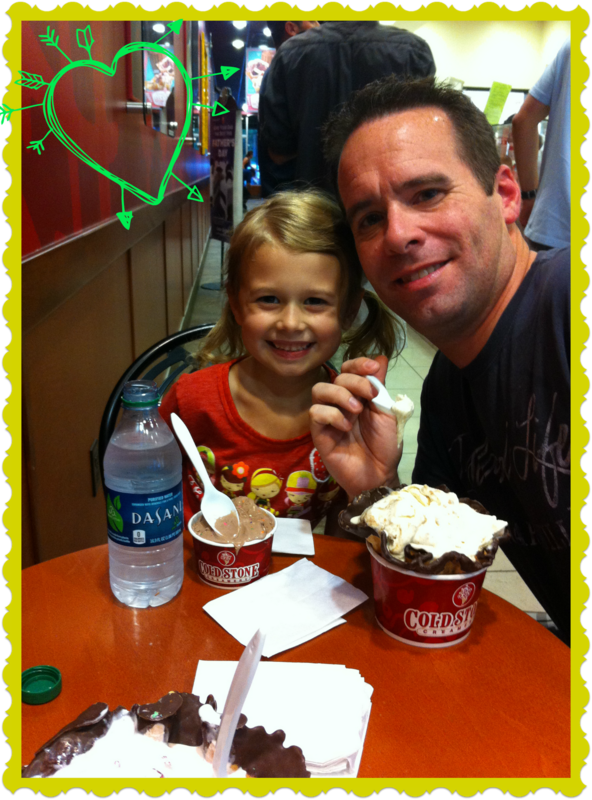 So low key....but still celebrating 6 beautiful years of my daughter, and many more to come!!! Today, was the first day of school for Abby. Ben and I have a tradition, every year on the first day of school we take whoever is at home to the zoo. So today Kay & Mason went to the zoo. We only spent a few hours, till Kay was tired, then came home. It was a perfect day!! 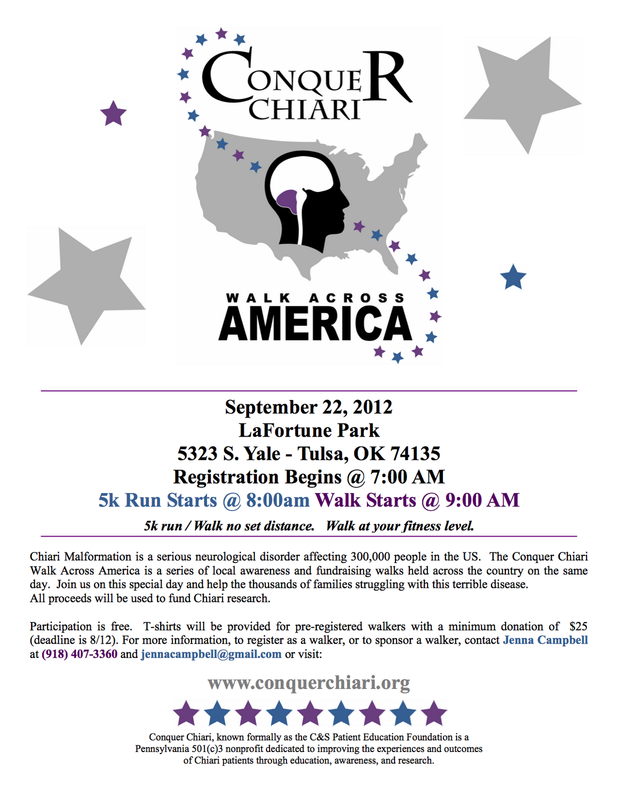 On another note.... we are almost just a month away from The Conquer Chiari Walk Across America!!! Our family will be participating in the Conquer Chiari Walk Across America on Sept. 22nd, in Tulsa, Ok. You can click here, to join the walk or 5K run. Our team is "Hanging With Kaylie". 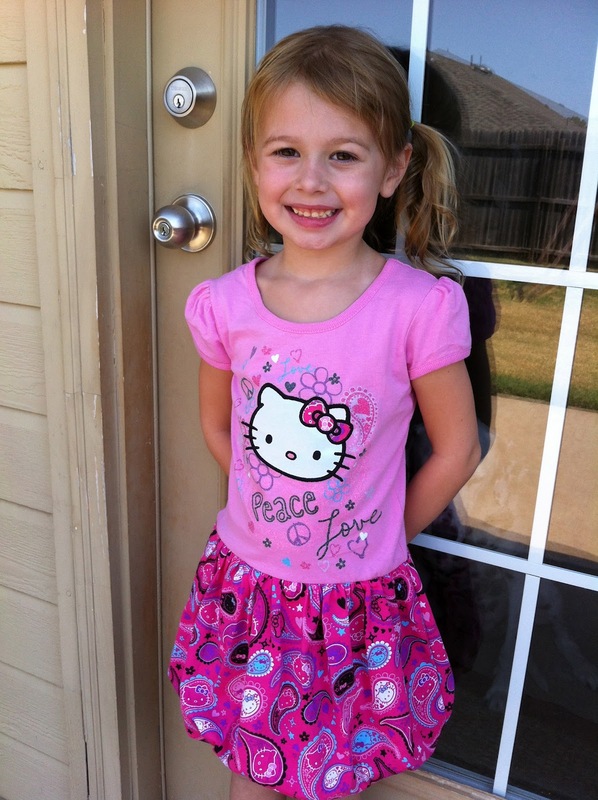 Or if you would just like to sponsor a walker or runner you can there, or sponsor Kaylie here, on her team page. 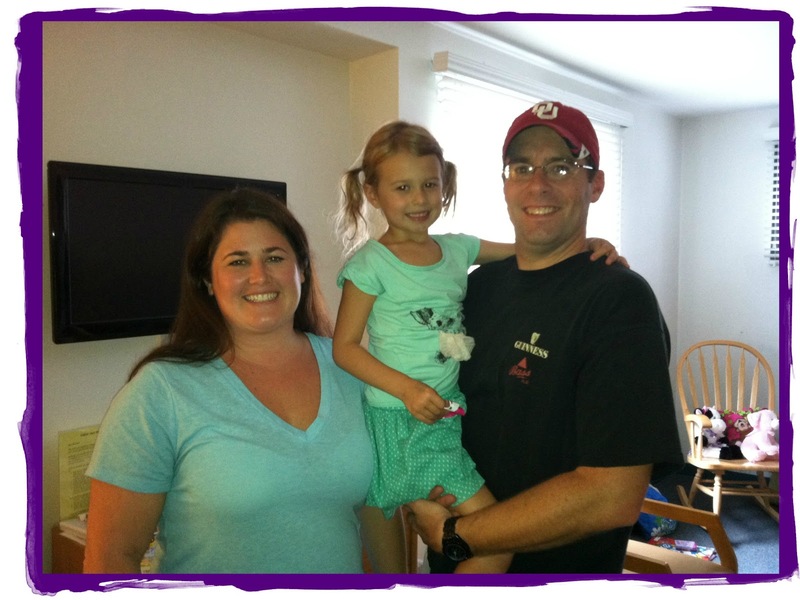 By sponsoring a walker/runner you are helping fund research for Chiari, and hopefully a cure will be found one day. Thank You for all your support! It has been a great weekend! Kaylie hasn't had a fever since Thur. evening, her throat looks 100% better, and her pediatrician texted me today to let me know that her mono titers were negative! Just a bad, bad bug! She has been feeling a lot better lately. She has been playing a lot in her room with barbies, calico critters.. what not, not really running around... but not laying around either. I have to remind her to take it easy. There has been a couple evenings she has had small headaches. Nothing like what she use to have. 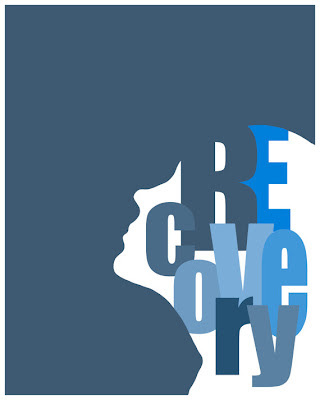 But, this is normal recovery for all this. A couple of her bottom steri strips and a middle one have come off. So far her incision looks really good! All of them are really loose, so probably this coming week more will be coming off. 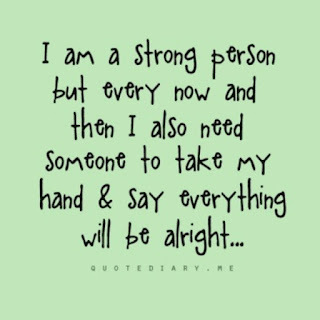 I saw this pic on Pinterest.... couldn't be any more fitting! 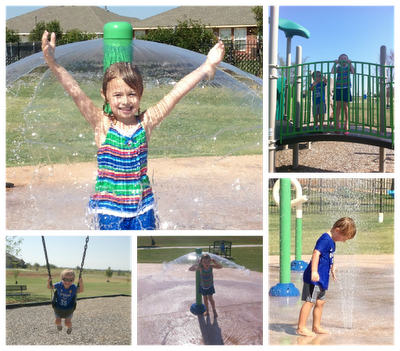 I as a parent feel like I am finally recovering from our trip, and getting back home into the swing of things. My nerves have come down a lot about her being around Abby & Mason. We haven't been out in about, mostly due to her being so sick, as soon as we got home. We went to my parent's Friday evening, she needed it... I think she was starting to feel a little cabin fever. I am trying not to think to much into Mason's condition... I really don't want to read a lot into it, until we get this other MRI done, and talk to Dr Rekate about it. It does worry me, I have joined a couple groups on Face Book for Basilar Invagination. I've been thinking a lot about school, and if i still want to go into nursing. The past few months with Kaylie's whole ordeal had me really questioning everything. Ben kept reminding me that it is so different when it's "your" child. I have two friends that are in nursing, and have talked to them recently about all this. I "Thank" them a lot.... because I think I just needed to hear someone tell me not to give up, that i would make a great nurse.... and to give me back that inspiration, that I see in both of them. My class for the fall doesn't start till Oct. it's just a small 8 week, online course. i think its just right, for where we are at in our family right now. I don't think I could handle anymore. I'm going to start working on a new section for this blog... "Related Conditions". There are a lot of other conditions that can go along with or cause Chiari. 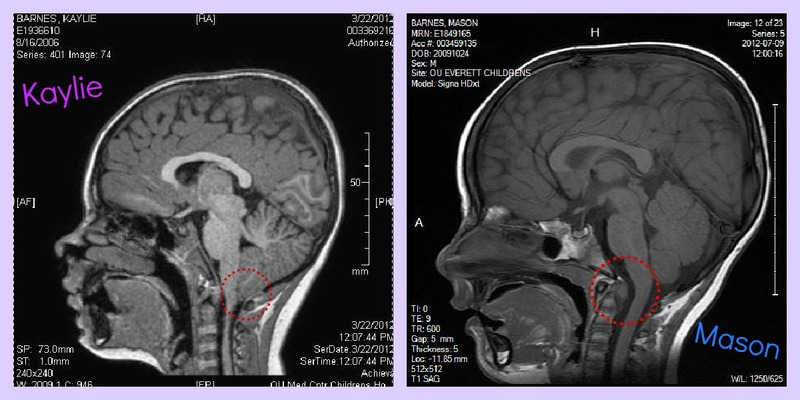 Kaylie just has Chiari, and Mason just Basilar Invagination. But since I have other come to this blog... I thought it would be helpful. It will probably take me some time to get it all up. 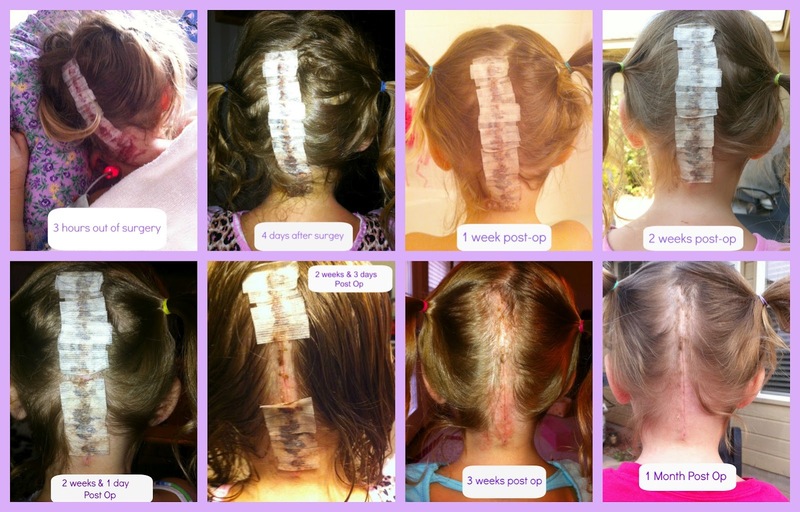 Kaylie is two weeks post-op!! And has been 24 hours free of a fever!!! Exciting, huh! We saw Dr Marcy yesterday, and all the strep tests came back negative. Everything looks good with her incision, but it was talked about that if the fevers continued the next few days, we would have to start looking into there possibly being chemical meningitis. And the way they do that is by spinal tap. Dr Rekate really doesnt feel that she has that, and really doesnt want a spinal tap done, unless she ends up on IV antibiotics. Luckily though, today has started a new change, and she is a lot more active & fever free!!! A mono test was done as well, yesterday. the rapid test came back negative, but the culture will take a few days. I know.... She just went through all this about a month and a half before surgery! So, I am starting a new pic collage of incision healing. This is something, I wish I could have found from other chiarians... mine will start right out of surgery, 4 days after... then every week. This helps me as well to see if there is any swelling or redness occurring. Its sometimes hard, since I see it everyday. Im usually asking my parents, how's it look?, any changes?... so on. 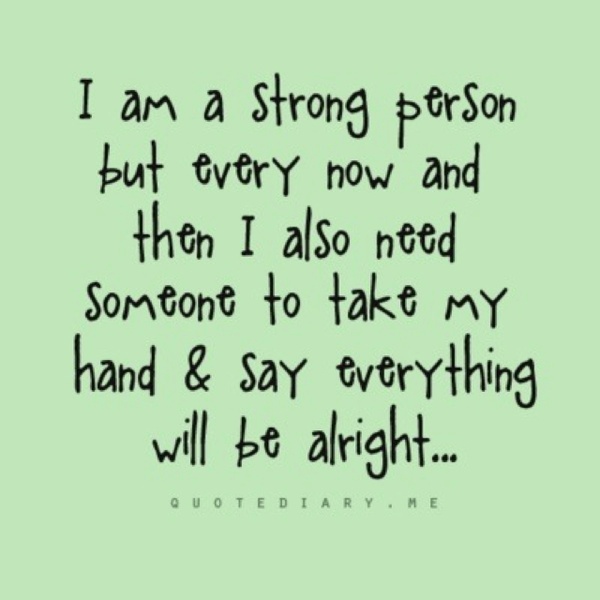 Plus... it may be a help to those that have to go through this as well, one day. The only problems when it comes to comparing, is that Kaylie had steri strips only. Some are done with sutures, and some staples. I can say, I really LOVE steri strips!!! 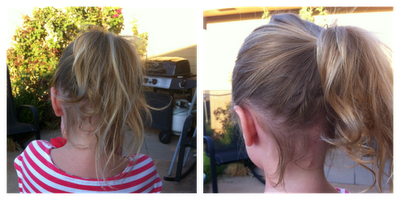 Her's are starting to loosen, and curly up... in which I just trim off the part that is not attached any more. So you can now see the very bottom of her incision, and so far... it looks great. She has been picking at it some, because it is itchy. Dr Marcy suggested Zyrtec for that, in which Dr Rekate liked the idea as well. She has only been on two doses of Zyrtec, and it is working, because she isnt complaining about it itching anymore. This coming Tuesday will be a busy day for us! At 10:30am, we go to meet her 1st grade teacher, and set up a plan for the next several weeks, since she won't be in school. She is super excited! then at 3:10, we have another appointment with Dr Marcy, just to recheck everything. Hopefully getting over this bug, we can now start a more peaceful recovery! Since being home, it has been a rough few days. 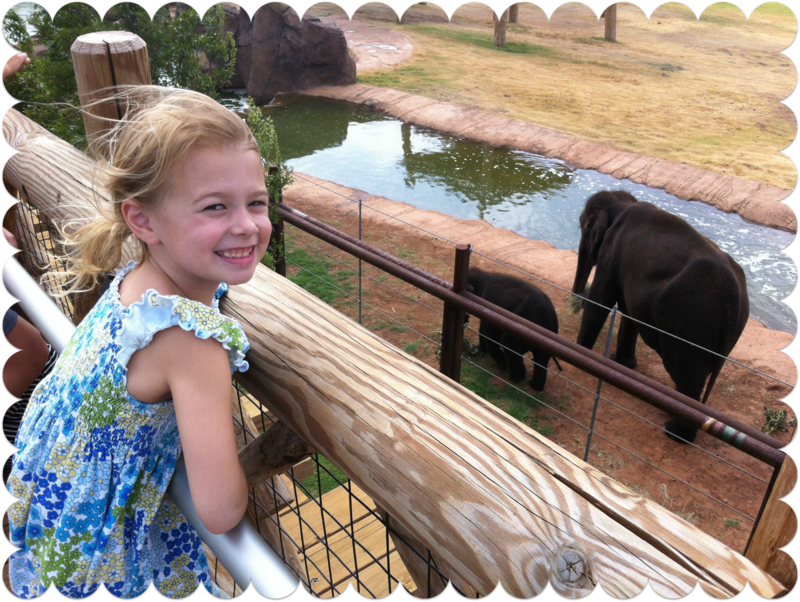 On Monday, Kaylie started a low-grade fever of 99.8 that morning. I gave her Motrin, and it went down, and everything was fine for the rest of the day and night. Then yesterday, she once again had a temp of 99.8, did the same of giving her Motrin... it went away. By 5pm last night... she had a fever of 101.6, and complaining that her throat, and back of her neck was hurting. I decided to take her to the ER, which time we got there, she had a temp of 102.9. They gave her Motrin. Looking in her throat, they saw that it was white & bumpy... thinking it could be strep, they ran a test, it came back negative. They also ran blood work, urine test, and did a chest X-ray. All of those things came back good. 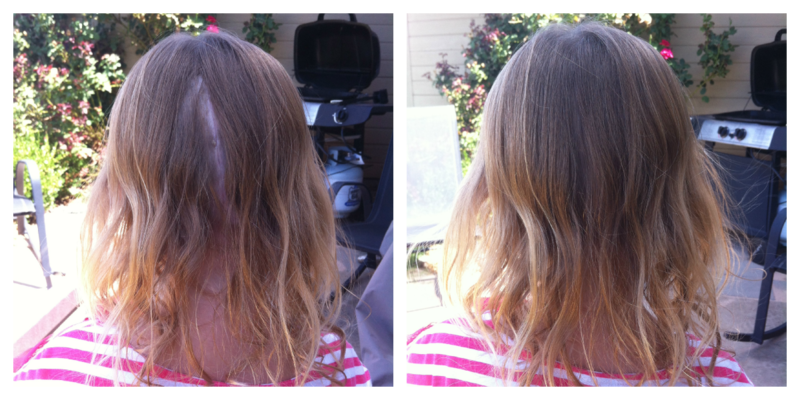 They also said her incision sight looked very good, and that she wasn't having any signs of the chemical meningitis. The Motrin they gave her in the hospital brought her fever down, and we were released, after they spoke to Dr Marcy. Then at 3am, I went to check on her... and she was up to 103 for a temp... I gave her Motrin, the fever came down, and she slept in till 10am this morning. She woke up with a fever of 100.3... I gave her Tylenol this time, and it has stayed down since. We have an appointment tomorrow morning with Dr Marcy at 9am. She has just been laying around, resting. The ER also sent her strep test for a culture... I haven't heard back on that yet, but hopefully she has just picked up a little virus. We got home yesterday, it feels so good to be here! My mom, dad & brother were at our house with dinner, and to see Kaylie. We all hung out for a little while, then we all crashed. I was so tired, I went to bed at 9pm! Kaylie is glad to be home.... I'm a little nervous, because I feel like I have to watch her extra, extra carefully now too, especially around her brother! So now what??? Well, Kaylie can not return to school till 6 weeks post-op. We see our pediatrician on Thur., just to check in with her. 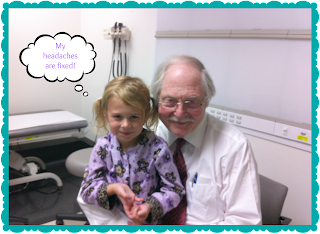 Kaylie has a swollen lymph node on the left side of her neck... but Dr Rekate isn't worried about it... they think its just due to all the trauma her head and neck have been through. And I have heard other moms, say their child had one too, for a while. We are still waiting for the steri strips to come off on their own... we have been washing her hair... so they are slowly starting to curl up, and soon will be coming off. Dr. Rekate like to touch base with his patients either in office or by Skype, 3 months post-op. Since he wants to see Mason, and Mason get the other MRI there, we will be driving out to Ben's family in PA in about 3 months. We can stay with them... and then take a day or two if needed and go into NY, from PA. Its only about a 2.5 hour drive. Today, we are going to unpack, laundry, I need to go to the grocery store, we have to pick up Ben's car at the department, and pick up our doggies! I wanted to Thank everyone again for all the prayers, kind words, love and support you have given us. 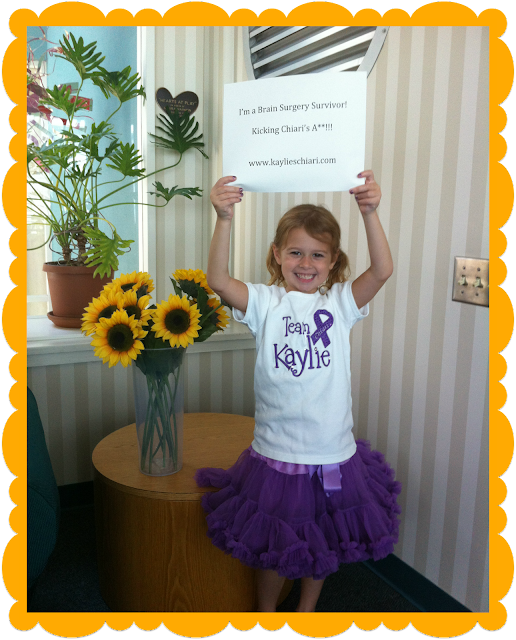 I truly believe it has helped Kaylie in her surgery time, and her recovery time. The power of it is amazing when so many people come together. I also have to say Thank you to Moore Police Department, for watching over our house!!! The guys my husband works with, and their families are our 2nd family. It's a unique bond we all have together. I will continue this blog during Kaylie's recovery, and of course the start of Mason's journey. 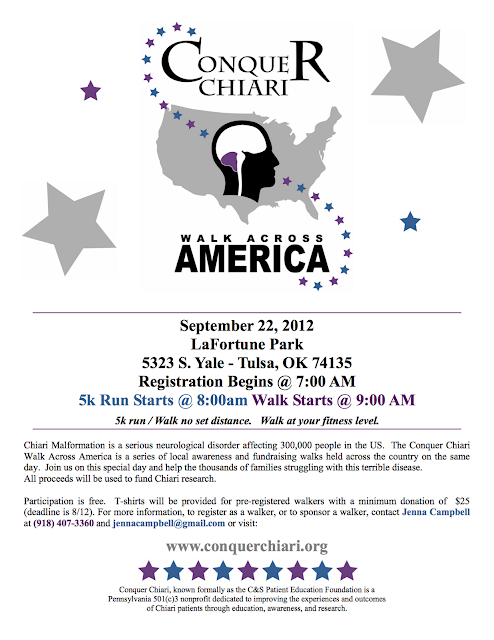 Next we have the Conquer Chiari walk in Tulsa....if you would like to run or walk with Kaylie, or sponsor her... contact me, and I can get you the info on that. You can also click on the walk picture, at the top, right side of this blog... and it will take you to that area. Today we said Good-Bye to one of our new Chiari Friends, Bailey! Today her, and her family left to go back home to Ohio. Sorry I haven't posted in a few days, a lot has gone on, good & bad, I just needed to get my thoughts in order. First, Kaylie is doing GREAT!!!!! We couldn't be happier with her recovery. I'm going to start back on Tuesday.... Tuesday came, Kay was doing really well, taking meds good, somewhat eating a little better. Ben's family came to RMH to visit. 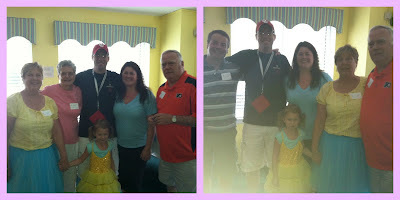 We had a great visit with them, and they were pleased to see how well she was doing. We went to a local diner for lunch with them, and Kaylie became really tired, but hung in there. Then we just spent the rest of the day at the house watching TV, playing in the playroom, and resting. Wednesday, Kaylie woke up with a bad headache, I immediately gave her medicine, in which 30 minutes later she vomited up. Then got sick again, 30 minutes later. We got her cleaned up, went to go get some breakfast, which she only ate one silver dollar pancake. 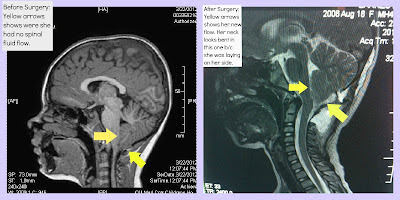 Then I headed to the hospital to get a copy of her last MRI scan, and to have medical records sent to her pediatrician. We then went to TCI to have our appointment with Dr Rekate. While we were there, we saw a familiar family from RMH, they were there because their 3 yr old son has Chiari... but the interesting part was that they were from Holland! 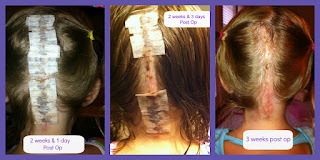 Dr. Rekate said Kaylie's incision looked great, there was no swelling or anything. He was happy to see how fast, and well she is recovering. He said that we could wash her hair, and that the steri strips would come off on their own. He wants to see Kaylie back in 3 months, and we said we were planning to come up, and to visit family in PA, so it would work out well. Then we finally talked about Abby and Mason's MRIs. 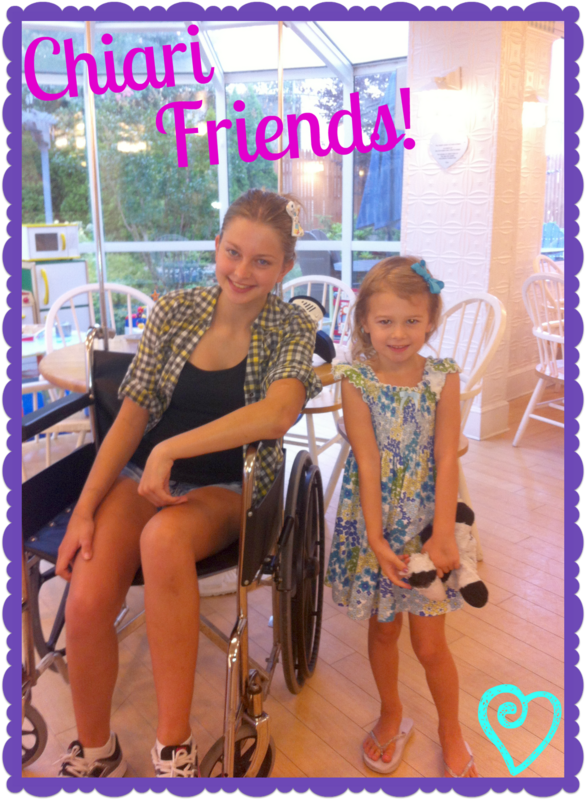 Both kids do not have Chiari, as of right now. 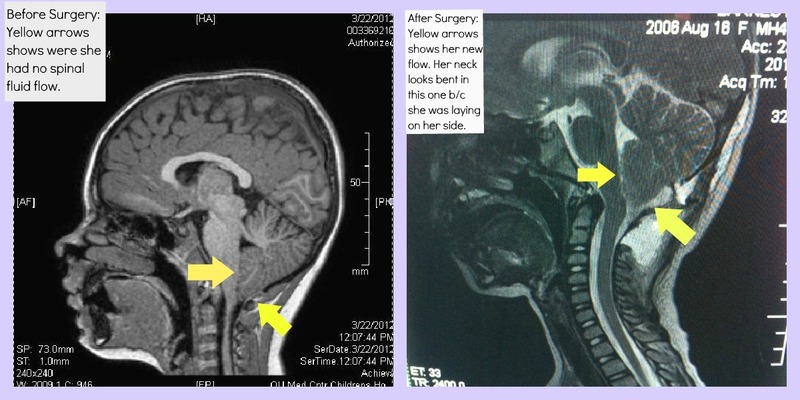 In Abby's MRI he said there was a little crowding, asked if she has any symptoms... we said no, and he said that's good. He just told us if she ever starts to have headaches or anything, to let him know. Mason on the other hand, has something called Basilar Invagination. This is a Chiari related condition. Dr. Rekate was a little surprised that Mason did not have Chiari, but had Basilar. Basilar Invagination is when your brain stem of the spinal cord is bent over, like its folding over a mountain. When I first saw Abby and Mason's MRIs when we first got them... I immediately was able to say that Mason did not have Chiari, and that I didn't think Abby did, but I wasn't sure. On Abby he said it was the crowding part that made me question it. And on Mason, he was surprised that I was able to see it on the MRI. I told him that I had watched his video, over 10 times... and that, when I saw that the brain stem was not straight like Kaylie's or other MRI pics I had looked at, I knew something was not right. When I had sent him the MRIs back on July 12th, I had talked to him about how after watching his videos, I think Mason's kind of looked like it... but that I wasn't him or a doctor, so we would see him when we get up to NY. I then joked with him, about hiring me to read MRIs. LOL... yeah, right... but maybe this is a sign I should go into radiology, instead of nursing! A whole other post, for a different time! So, what now you ask, with Mason. Well, he had asked if they were with us in NY, I said no, back home with my parents. He said when we come back to see him in 3 months with Kaylie, to have Mason come too (which was our plan), and he wants Mason to have a MRI at North Shore, of the cervicles. I guess with Basilar, it has to do with the C2 being pushed upward or forward... something like that. And then we would go from there. He asked if Mason has any eating or swallowing issues... I said no, he eats great. He can go from soft to hard textures very easily. He asked if he has had any symptoms like Kaylie, i.e. : headaches, neck pain..etc. I said no, they only issue Mason has, was that he is very delayed in Speech. He said that was common for these kids... he also said that it was possible that Mason in a couple years... about Kay's age might have Chiari, as he grows. Surgery is a treatment to correct the bend of the brain stem.... BUT, after we have the MRI in Oct, we would talk about all that. He said their is a good possibility, that if he isn't having symptoms, that we just watch it. I plan on adding an area about Basilar Vagination to the top of the blog. It will explain it more. I will also, add a pic of Mason's MRI on here when we get home. It's actually weird to look at the difference between his and Kaylie's brain MRIs. 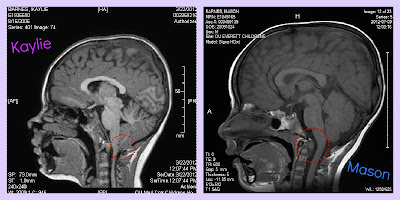 Between them both you can really tell the difference with one with Chiari, and one without.... then also between one with Basilar Invagination and one without. My state of mind with it all, as Ben likes to say, while we were in the office talking to Dr Rekate, I was calm and collected... when we got in the car, the water works started!! Even though I knew a little... I was once again upset being told it was true. The rest of the evening was talking to family, after dinner at the house we went to go get ice cream, came back to watch Big Brother! Today was a good day... Kaylie hasn't been on any medication, we do our neck exercises often. We hung around the house today, went and got some NY pizza for lunch. 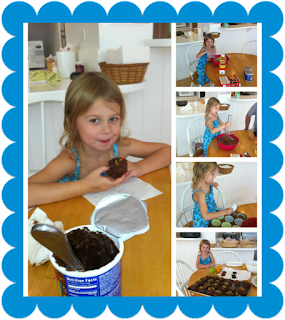 Then Kaylie & I made cupcakes for the house! They must have been a hit, because they were all gone by dinner time! We also washed Kaylie's hair for the first time today. The next pics are of her incision, I have been getting a lot of questions of what it looks like, how bad is it, how long is it, or does her hair cover it. It actually looks really good right now, I couldn't be happier!! The 1st pic is 4 days after surgery, 2nd pic is first hair wash, and the 3rd pic is her hair dried, it covers up pretty good. After dinner we hung out in the kitchen with our "Chiari Family".... it was so nice getting to know everyone.... Julianna & Brenda are some of the sweetest moms I know... I will miss them when we all depart! Since being here, there is a total of 5 families here for Chiari, and related condition. Two of them were in the hospital at the same time Kay was... Bailey & Alaina. Bailey (one of the older chiari girls) gave Kay a balloon. Thanks Brenda & Bailey... she loves it!! Dr Rekate said we are released to travel home, so we will be coming home Sunday!!! We can't wait to be back in Oklahoma, even though NY has grown on me a little... kind of miss living in a bigger city. But, we can't wait to see all our friends, and especially our family!! !